This is an exciting bit of news from the Harvard Stem Cell Institute, as reported in Gizmag magazine, 22 February 2016. At the bottom is the link to the original research article published in Cell Stem Cell. Patients with Type 1 diabetes suffer from an absence of pancreatic cells called beta cells, which are responsible for producing insulin. Researchers have been trying to tackle the deficiency for decades, but now it seems that significant progress may have been made – a team of scientists lead by researchers from Doug Melton’s Harvard Stem Cell Institute have discovered that it might be possible to engineer tissue from the lower stomach to address patients’ insulin needs. For the new study, the researchers worked with laboratory mice genetically engineered to express three genes that can, under the right circumstances, turn other cell types into beta cells. The team carefully studied the mice, testing each part of their anatomy for the most amenable cells for conversion. After much analysis, it was determined that cells from the pylorus region which connects the stomach to the small intestine, were the best candidates. 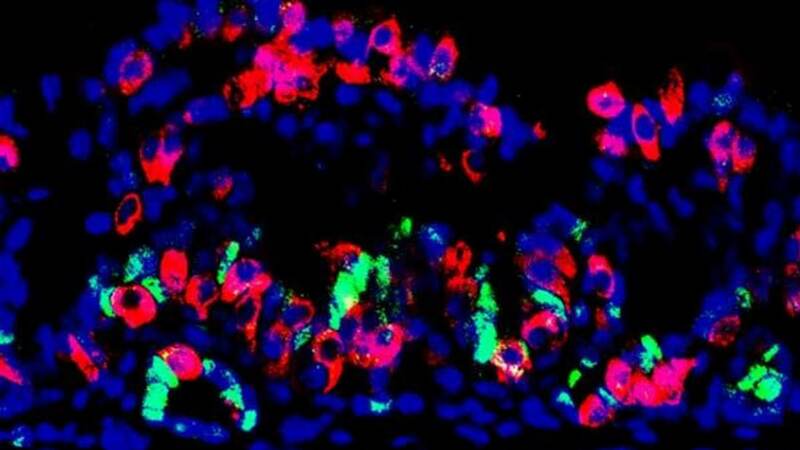 A section of the gastric mini-organ can be seen here with immunofluorescent staining – the insulin-producing cells are visible in red (Credit: Chaiyaboot Ariyachet). The cells were found to be most responsive to high levels of glucose, normalizing the subject’s blood sugar by producing insulin. Their effectiveness was tested when the researchers intentionally destroyed the creature’s pancreatic beta cells, effectively forcing the cells to respond if the subject was to survive. The results of the test were very positive, with the mice surviving for the entire length of the study – some six months – with their reprogrammed pyloric cells producing insulin to keep blood sugar levels in check. By contrast, control animals without the reprogrammed tissue died within eight weeks. Looking towards converting their findings into a usable treatment, the researchers took a slightly different approach. As turning on the three genes responsible for the insulin production isn’t a good option for human trials, the team instead extracted stomach tissue from the mice and engineered it in a lab environment, growing the cells into miniature stomachs capable of producing insulin and replenishing themselves. These mini-organs were tested in the laboratory mice, with the researchers implanting them in the membrane covering the inside of the animals’ abdominal cavity. The team then destroyed the mice’s ability to produce insulin, finding that the mini-organs compensated at the expected success rate, with the glucose levels of five out of 22 test animals staying normal. The team plans to continue its work, and hopes to develop the research into an effective clinical therapy that’s tailored to individual patients.